Courthouses, as expressions of state power and authority, frame and legitimise the rituals of justice enacted within them. Yet, there has been little research into the nineteenth-century architecture of New South Wales courthouses and how their external appearances and internal layouts supported the administration of justice. 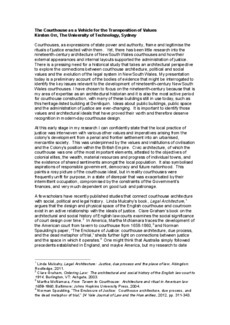 There is a pressing need for a historical study that takes an architectural perspective to explore the connections between courthouse architecture, political and social values and the evolution of the legal system in New South Wales. My presentation today is a preliminary account of the bodies of evidence that might be interrogated to identify the key issues relevant to the development of nineteenth-century New South Wales courthouses. I have chosen to focus on the nineteenth-century because that is my area of expertise as an architectural historian and it is also the most active period for courthouse construction, with many of these buildings still in use today, such as this heritage-listed building at Deniliquin. Ideas about public buildings, public space and the administration of justice are ever-changing. It is important to identify those values and architectural ideals that have proved their worth and therefore deserve recognition in modern-day courthouse design.